This is a joint piece I co-wrote with Felix Morgan, Senior Strategist & Innovation lead at our Partner, Livity, following our youth influencer event #UseYourInfluence on March 8th 2017. With more and more channels, brands, and people bombarding us permanently, attention has become our dearest currency. Banner blindness, ad blockers, CTR fails are all down to the same circumstance. Consumers of all ages treat their time and their attention as premium currency and if they are – consciously or unconsciously – willing to spend it on your story you win. UK audiences now switch channels 150 times a day and check their phone 21 times an hour. And yet an unbelievably small number of people now cause about 90% of the impact on conversations (across pretty much any metric), so there’s a huge opportunity to be had if we can identify and leverage those voices. Given Livity’s focus on young people, influencer marketing is even more important for them. While young people have all the same macro drivers for dependence on influencers, they also have some more personal drivers – young people are still working out their identity and their views of the world, so they’re always looking to find guidance from people like them. At our joint breakfast event Use Your Influence two weeks ago, we looked at the changing nature of the influencer landscape, the most common problems brands face when it comes to working with influencers, and the best ways to create effective influencer strategies, whatever your brand or budget. We were also lucky enough to be joined by Dottie James who has built up a following of almost 200k followers on YouTube and works with brands such as Pepsi and Google. It can be very tempting early in your comms planning process to see reach as the most important thing to look for when picking influencers but there is a tonne of evidence indicating this is no longer true. A recent study by Markerly showed that, as an influencer’s reach increases, engagement with their content decreases, and is down to an inverse relationship between reach and accessibility. Some of these influencers earn millions of dollars and are on the cover of every magazine. They’re driving supercars and buying mansions, making it very difficult for your average young person to relate to them at all. This decrease in accessibility makes them far less influential with their audience, and it’s something influencers themselves are constantly battling with. In 2017, you need to focus a lot more on getting the balance right between three core components of influence: reach, authority and accessibility. Secondly, influence today is built on a major false assumption. Brands treat influence like an entirely new concept, but it’s existed as long as humans have. Any person who has ever had any social interaction has either wielded influence or been influenced, and while social media undoubtedly plays a big role in influence today, it’s not all encompassing. Influence happens in the pub, in the school, with the family, in sports teams, and relying entirely on social APIs is not going to give you the full picture. To really understand your audience’s world, you undoubtedly need to use social data, but you also need to find out about other factors that aren’t included. 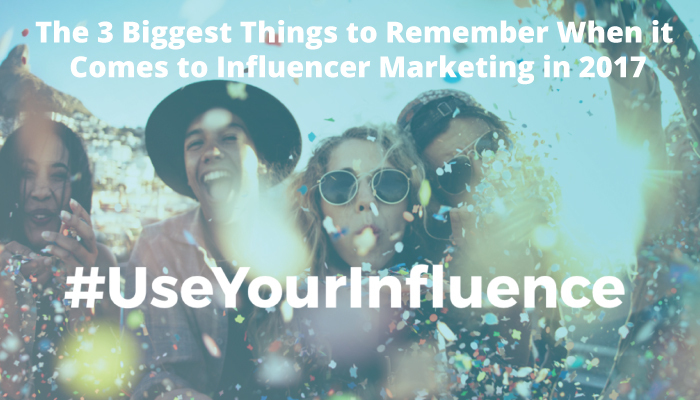 And finally, in 2017 you really need to move beyond just finding a list of influencers. And that’s not to disparage the value of crafting a good list of influencers to engage with – that’s an incredibly valuable first step that, if done right, probably puts you ahead of a vast portion of the industry. However, one of the big challenges prospects keep feeding back to us is that they identify lists of influencers and then have no idea what to do with them, when they really need to create more of an actionable plan. Otherwise you’ll end up with inauthentic activations that are worthless to the brand, worthless to the influencer, and do very little to impact the lives of your audience. During our event, which featured brand directors from Coca-Cola, Airbnb, Guinness World Records and Red Bull, we also shared some of our best global examples of influencer strategies, as well as some of our top tips for working with influencers such as #ThinkLikeAFan –understanding what your target influencer/consumer spends their attention currency on, essentially being ‘more human and less brand’ – and ‘Value first’ thinking – understanding what exactly the value is to brand, audience and influencer. We also talked about Viewpoints, Livity and Onalytica’s bespoke product which combines Onalytica’s experience in quant data and Livity’s specialist knowledge in youth to give brands a 360° view of their influencer landscape – and ultimately opportunity. Whereas traditional influencer mapping projections have tended to focus solely on the impact of online influencers and social media, Viewpoints also incorporates offline influences. We developed and trialled Viewpoints on a number of projects we were working on for Livity’s client Google. Google wanted to create a network of female influencers that they could tap into around a series of passion points – music, fashion, tech, travel and beauty. Livity recruited a panel of their target audience from all across the country and over three weeks worked with them over an online collaboration platform to unpick their influences and understand how they engaged with content. Armed with these insights, we homed in on 60 key influencers spread across the different passion points, all with less than 20k followers. This meant they could engage with them for product launches, invite them to events, and engage with them in an always-on programme to bring them deeper into the brand. Importantly though, the additional qual work also provided loads of valuable insight into the types of content, tone and messaging that resonated best with both the audience and influencers, and it helped inform Google’s ongoing social engagement strategy. If you would like more information on Viewpoints or to come to our next event, please contact Viewpoints@www.onalytica.com. This post was first published by Felix at Livity, on LinkedIn.